I read this article and found it very interesting, thought it might be something for you. 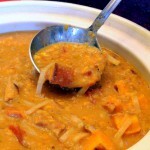 The article is called Curry Peanut Soup and is located at http://www.gardendish.com/curry-peanut-soup/. 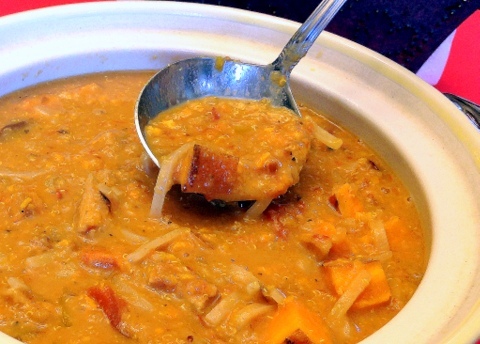 Exotic in flavor, creamy mouthfeel, crunchy bits of peanut, filling and satisfying – this curry peanut soup has it all. And because it’s a slow cooker recipe, you can do the prep work the night before, and let it cook the next day while you’re off doing other things. This is a memorable soup, and worthy of guests and special events, but hearty enough for everyday meals. In a nonstick skillet over medium heat, dry sauté the onion, pepper, and garlic until tender, about 5 minutes. Add to the slow cooker. Stir in the sweet potatoes, diced tomatoes, quinoa, water, tamari, ginger root, and curry powder. Cover and cook on Low for 8-9 hours. Use an immersion blender to puree some of the soup, until desired level of creaminess is reached. Stir in the peanut butter until dissolved. Add the raisins, dried apples, and broken brown rice noodles. Cover and cook on Low another 15 minutes. Salt to taste. The Thai Kitchen brand of Brown Rice Stir-Fry Noodles comes in small, plastic bags of 2 oz each. This makes it easy to break up the noodles simply by pounding on the bags with your fist or crushing them between your fingers. Either way, have fun with it and get out your frustrations from the day. Nutrition (per serving): 489 calories, 56% calories from carbohydrates, 12% calories from protein, 31% calories from fat, 8.7g fiber.